One of the best ways to know where my signal is going is WSPR. There are two limitations to using WSPR. First, the transmission start time of WSPR must be accurate to standard time. 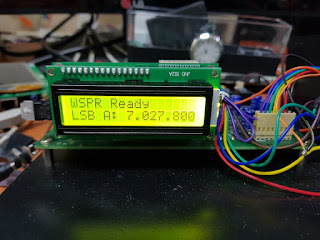 The second is that WSPR is not supported by the radio, so you should use a computer or a laptop. The first problem is that you can use a wristwatch that has recently been checked for errors. 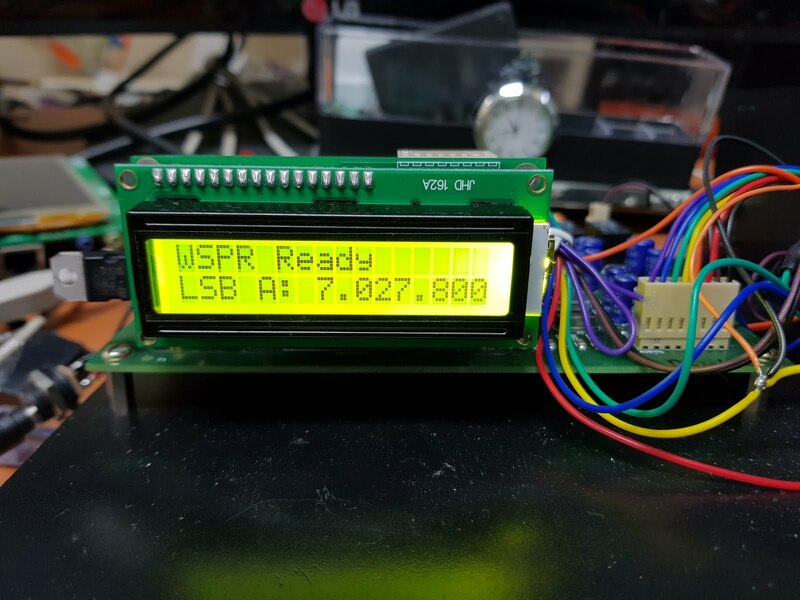 If you look at the source code that you use for WSPR reporter, error of 1 ~ 2 seconds is allowed. If you go camping outdoors, you can set the time on your wristwatch precisely before departure. Many people use GPS to calibrate their time, but in the case of regular GPS, errors are introduced via the serial port. The implementation of such a digital program is difficult for the receiver and the transmitter is not so difficult. 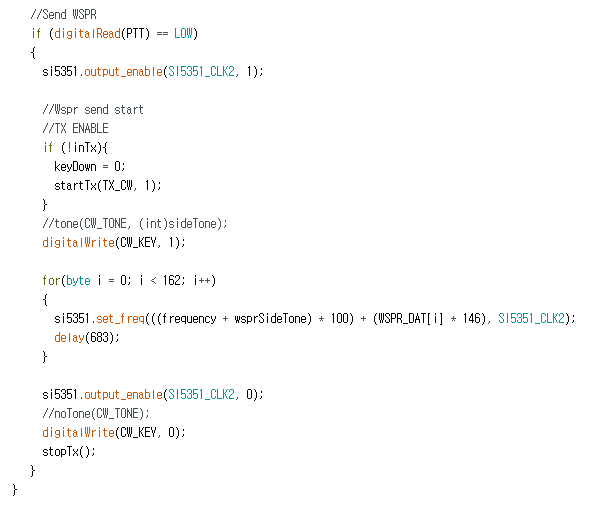 So in recent years it has been implemented in Arduino. uBITX was able to port easily because it uses C language based on Arduino. I just can not use the code to control the si5351 that uBITX uses, so I used a different library for WSPR transmission only.The results exceeded Arduino's firmware. So I removed some of the features that I have implemented so far and removed some of the features of WSPR. Later in time, I think I can fix this problem by modifying the Si5351 control code. 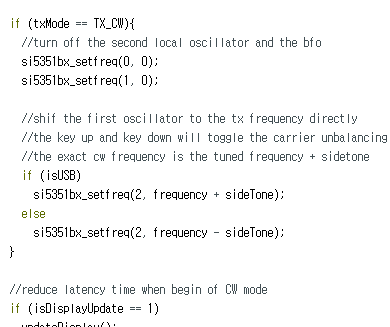 The most important part to implement WSPR in uBITX is below. Moving the frequency of CW will change the pitch of the sound in SSB. 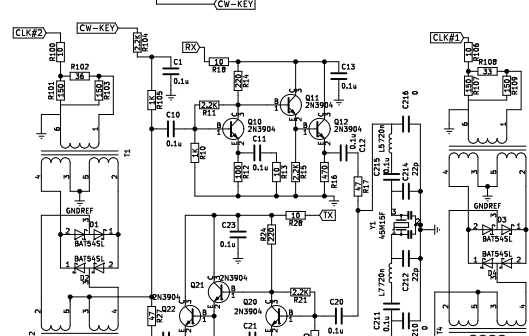 It will be able to transmit WSPR to uBITX without any hardware modification. 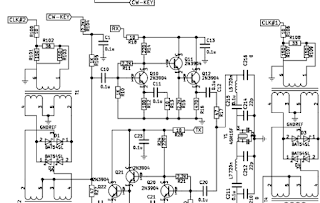 Below is a partial schematic of uBITX. 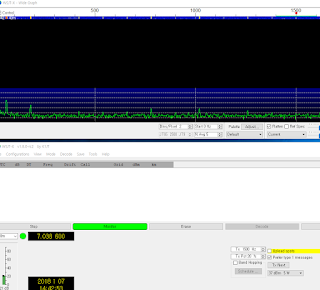 As you can see from the circuit, when transmitting CW, only the frequency to be directly transmitted to CLK2 is input. 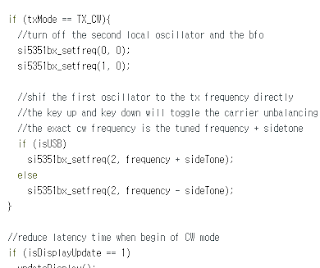 Below is the source code at the start of CW transmission.It can be seen that CLK2 oscillates by adding the fundamental frequency and sidetone. WSPR generates 162 tone data. One tone can have values of 0, 1, 2, and 3. 0 is the reference frequency, 1 is the reference frequency plus 1.4648 Hz, 2 is 1 plus 1.4648 Hz, etc. 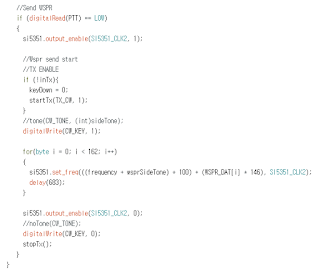 As you may have guessed, the above code does not handle multi-threading. Probably an error will occur in CAT communication etc. In this case, the timer interrupt is very simple to implement. Arduino is the first one I use this time (with uBITX), so I finished with the possibility of sending digital communication including WSPR.